In 1996, Kiwi Rob Hall and his company Adventure Consultants took a team of climbers along with a group of paying clients to Kathmandu with the hope of reaching the summit of the world’s highest mountain on 10 May. The disaster that subsequently occurred was recorded in memoirs by several of the survivors, most successfully by professional journalist Jon Krakauer, whose book Into Thin Air became a bestseller and was adapted into a less-than-successful TV movie only a year after the tragedy. Following such startlingly impressive opening films as Gravity and Birdman, Icelandic director Baltasar Kormákur’s new film Everest (2015) now opens the 72nd Venice Film Festival. It’s an occasionally moving account of the disaster, ironically hampered – considering the dangerous pursuit – by a very cautious approach. The accounts don’t always match up between Krakauer and Russian climber Anatoli Boukreev and the film does its best to avoid pointing the finger of blame, sapping the film of dramatic energy. We first meet Hall (Jason Clarke) at the airport as he says his farewells to his pregnant wife Jan (Keira Knightley). Clarke sets the tone in a beautifully subtle performance. His mountaineer is a can-do Kiwi with a genuine affection for his charges and a respectful attitude to the mountain. Climbing Everest is “pain, pain, pain” he tells his clients. Along for the trip are Krakaeur (played by House of Cards regular Michael Kelly) and an ordinary working stiff Doug (John Hawke) who failed to reach the summit on a previous attempt. Beck Weathers (Josh Brolin) is a cocksure Texan, who tests Rob’s patience and Yasuko Namba (Naoko Mori), a Japanese woman who has climbed six of the world’s seven peaks already and needs Everest to complete her collection. At Base Camp, the climbers find a crowded mountain, with a South African climbing team and a rival company Mountain Madness led by Scott Fischer (Jake Gyllenhaal) also vying for the summit. Although there is some initial tension between Scott and Rob – Krakauer has been poached from Scott’s group – the two are friendly rivals who decide early on to work together in keeping both of their groups safe. “The mountain always has the last word,” Scott’s climber Boukreev (Ingvar Sigurdsson) reminds them all. Beautiful location shots are intermingled with so-so CGI. More annoyingly, as the action progresses, we return to the studio bound tent of coordinator Helen (Emily Watson) as she helplessly follows the action with another climber, Guy (Sam Worthington). As Rob and Scott lead their groups into the death zone – a point above 26,000 feet when the body effectively begins to die – small mistakes and misunderstandings begin to precipitate the danger. Beck and Doug are struggling as relative novices but so is carefree but experienced Scott. When a storm hits the group, it’s a deafening and terrifying assault on the senses. As death becomes inevitable, the emotional power comes from the quietness of Clarke’s performance. A telephone call with Jan is particularly heartbreaking. But considering the cost in human life, viewers might be left asking why people would risk their lives in such a foolhardy way, a question bluntly round-tabled by Krakaeur in one of several overly on-the-nose scenes from Simon Beaufoy’s and William Nicholson’s screenplay. 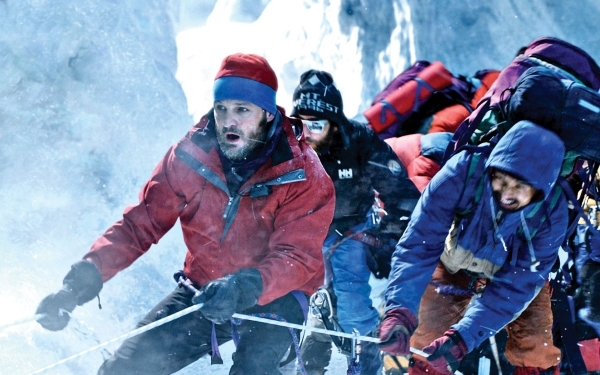 Ultimately, Everest is not concerned with the why, but with the how and it’s grimly efficient at building up the drama, helped on by Clarke’s wonderful character study, even if the film as a whole never quite reaches the dizzying heights of its subject.